World of Warcraft Chronicle: Volume 2 caught us up on events leading to and including the First and Second wars on Azeroth. 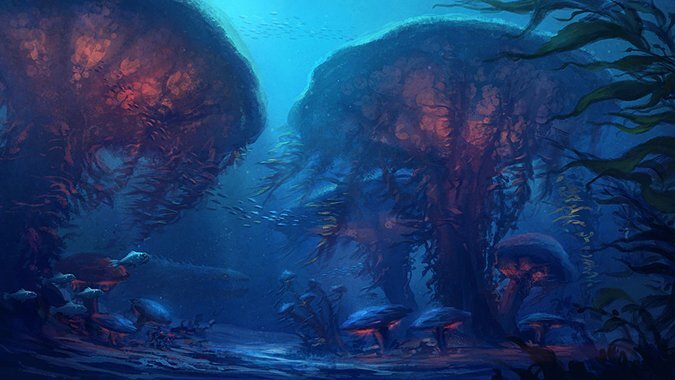 But in addition to that, we got our first real look at the evolution of life on Draenor – how everything on the planet came to be. Unlike Azeroth, Draenor’s history was a lot more volatile…and remnants of that initial chain of evolution continue to touch the planet, and its remnants, to this day. Please note: Today’s Know Your Lore will be discussing events and history presented in Chronicle Volume 2. While all of this is ancient history, those wanting to read the book for themselves should probably do so before tackling this column. 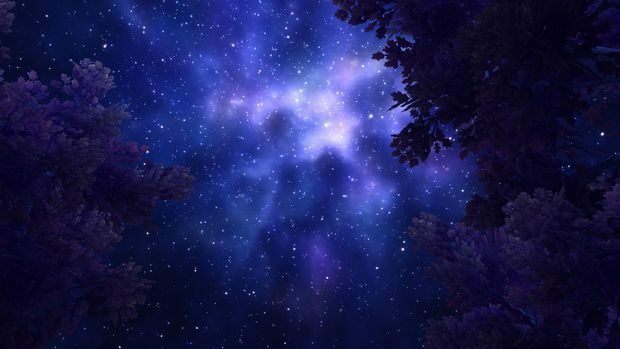 Unlike Azeroth, Draenor had no world-soul occupying it – it was just a planet, nothing more. This had an immediate effect on the planet. Azeroth’s world-soul consumed much of the fifth element – the Spirit of Life – in its efforts to grow. This resulted in elemental spirits that were volatile, unchecked by the element of Spirit. On Draenor, the opposite effect occurred. With no world-soul to devour all that Spirit, it was left to temper the elemental spirits, and even prevent them from taking on physical forms. But it had another effect as well – life itself. With nothing to keep them in check, the flora and fauna of Draenor flourished into a wild cradle of untamed life, fighting for dominance over the world. Strangely enough, the most powerful creatures on the world weren’t the animals – they were the plants. 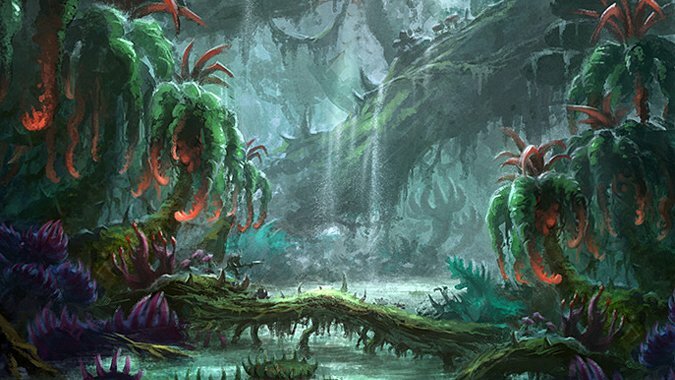 Carnivorous strains of plants sprouted and thrived on Draenor. Called Sporemounds, these gigantic plants sought to simply expand and grow. In order to keep growing, they tapped into the ground looking for water – and instead tapped into that abundance of Spirit present on the planet. The effects were astonishing. Due to Spirit, the Sporemounds developed into a sentient, communal, connected intelligence, allowing them to act as a single organism. It was called the Evergrowth. Working in concerted unison, it collectively dominated the entire planet. In the meantime, Sargeras had already ditched the Pantheon in favor of forming something far more sinister, leaving his second, Aggramar, to take over his demon-hunting job. It was while on this search that Aggramar stumbled across Draenor, as yet untouched by Titan hands. Although he listened for the telltale signs of a world-soul, he found none – but the world was still pretty fascinating. Unfortunately, it was also destined for disaster. Left unchecked, the Evergrowth would eventually consume the planet. Left with nothing else on which to feed, it would eventually have to begin consuming itself, leaving nothing but wasteland behind. As a creature of order, Aggramar didn’t want to leave Draenor to that kind of fate, so he decided to step in. But simply destroying all plant life wasn’t an option – he didn’t want to destroy it, he just wanted to temper it and keep it under some form of control. In order to accomplish this, the Sporemounds that formed the heart of the Evergrowth’s collective power had to be destroyed. Aggramar knew he couldn’t directly intervene, so he did the next best thing – he created an entity to do the job for him. Fire, air, earth and water were all utilized, coming together in a massive elemental storm. Aggramar then channeled that energy directly into Draenor’s largest mountain. The mountain roared to literal life, fueled by that elemental power, and stood up on its own two legs. Satisfied, the Titan named his creation Grond, and set it to work on the task of halting the Evergrowth. In the process, Grond walked the surface of Draenor and essentially terraformed the planet. Valleys, mountains and seas of molten fire were created, all with the purpose of dividing the Evergrowth into manageable sections. Three mighty Sporemounds ruled over the world’s surface, and Grond intended to tackle each in turn. The first, Zang, was the smallest – and it was also the first to fall. As Grond tore the colossal body of Zang apart, its corpse fell to the ground, where it would later transform into the region called the Zangar Sea. 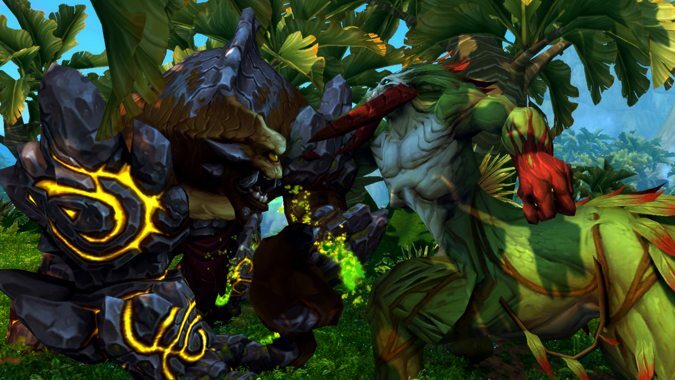 The second, Naanu, was similarly crushed, its body of dense jungles eventually developing into the Tanaan Jungle region. But by this point, Grond was weakened – and he still had the strongest Sporemound to contend with. The third Sporemound was called Botaan – and it sensed Grond’s weakness. Seeking to take advantage, Botaan leeched the dwindling essences of both Naanu and Zang’s corpses, growing to colossal proportions. It sent small tendrils out to lash at Grond and take root – and Grond ignored them until it was too late to do anything about them. 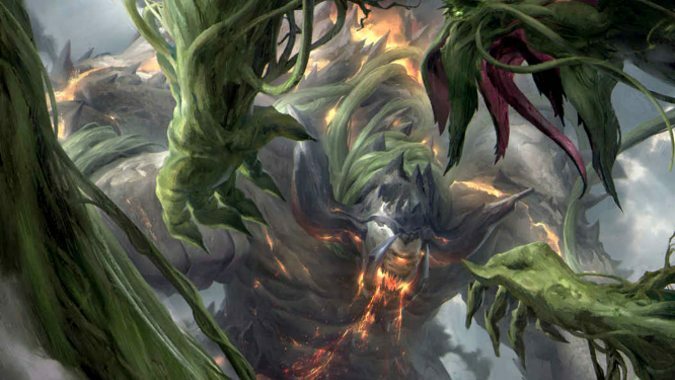 In one mighty move, the vines wrenched open Grond’s body, and Aggramar’s creation crumbled. Botaan had succeeded…or at least it seemed the Sporemound had. But while the bulk of Grond’s corpse formed a mountain range at the northern edge of Nagrand, chunks and pieces of the creature formed new life as they fell. These developed into the colossals – sentient beings not quite as powerful as Grond, but numerous. Similarly, pieces of Naanu and Zang developed as they fell. The largest of the giants were the genesaur. And the elemental storm that helped shape Grond also rained from his body, creating pools of power that later created the first physical elementals on Draenor, the most powerful of these being the Elemental Furies. They grieved the death of Grond, and lingered in his corpse’s shadow in a place eventually called the Throne of the Elements. Although Aggramar was disappointed that Grond had fallen, the rise of the colossals left him with hope. These fragments of his original creation weren’t quite as strong, but they were numerous – and Aggramar had a plan to help them out. He fashioned stone discs from Grond’s remains, branding them with runes of power and fusing them into the bodies of the colossals. This empowerment left the creatures strong enough to strike at Botaan. Meanwhile, Botaan and the genesaur were busy at work reforming the Evergrowth, assuming that with Grond’s death, all was well. They were mistaken – Aggramar had learned plenty about the weaknesses of the Sporemounds through Grond, and imparted that knowledge to the colossals before setting them to fight. 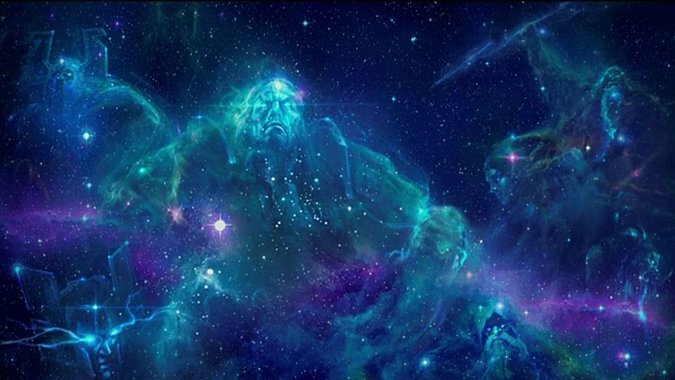 But before that fateful battle could occur, Aggramar sensed a ripple of energy from somewhere in the cosmos – a constellar had been slain. The constellar were servants of the Titans, keeping watch over the worlds that had already been put to order. The death of a constellar meant that something terrible had happened – something that needed to be investigated. Although Aggramar’s work on Draenor wasn’t yet complete, he had to leave. So he charged the colossals with defeating the Evergrowth, said his goodbyes, and left, with the promise that he would one day return. That, unfortunately, was not to be. For he left, unbeknownst to him, to encounter the Burning Legion and Sargeras, and he would not live through that confrontation. Left with their instructions, the colossal began their attack on Botaan. With the knowledge Aggramar had gleaned from Grond, they planned their attack, luring Botaan from the heart of the Evergrowth into rockier terrain. The Sporemound followed them far from the Evergrowth’s borders, underestimating the smaller beings as being inferior to Grond and therefore more easily defeated. It proved to be Botaan’s downfall. 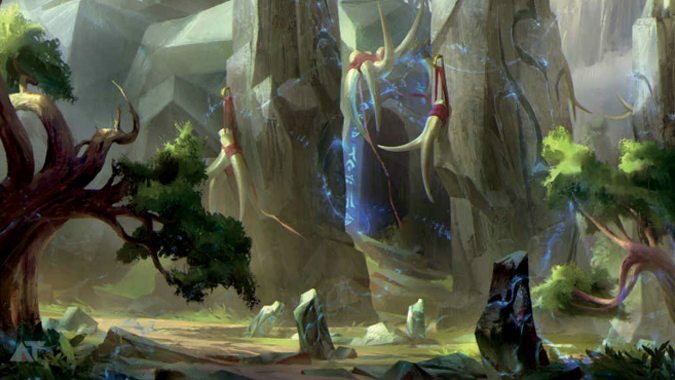 For thousands of years, the colossals and Botaan fought, littering Draenor’s surface with pieces of themselves that developed into other, smaller creatures, stone giants called magnaron. Less intelligent than the colossals, the magnaron simply roamed the world in search of volcanic activity, battling genesaur only if they crossed paths. Nearly at the end of their existence, the colossals chose to make one final stand. Using the runes that had been grafted onto their rocky hides, they unleashed the power on Botaan, sacrificing themselves in the process. The resultant explosions shattered their bodies, hurling them across Draenor, and utterly annihilating Botaan. The Evergrowth had been defeated – but the colossals were dead, their broken bodies spawning no other descendants, simply sinking into the earth. 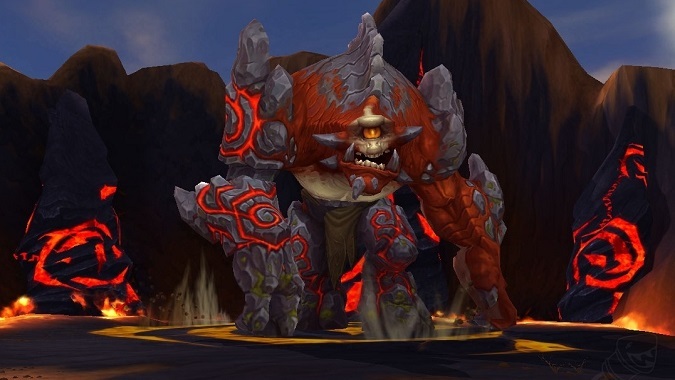 Eventually, those bodies formed the veins of an almost indestructible metal called blackrock ore.
It’s hard to picture what this must have looked like, but we can get a general idea just from what we witnessed on Draenor during Warlords. The magnaron were massive – but they were just fragments of fragments of a creature that dwarfed them all. The genesaur are gigantic – but again, they were simply fragments of something much, much larger. And Draenor itself continued to develop and evolve due to Aggramar’s intervention, although nothing on the planet really knew it. The descendants of Grond became the Breakers, and the descendants of the Sporemounds became the Primals. Both were set against each other, though it’s unlikely either one really knew the reasons why. We don’t really know what Draenor looked like in those ancient times. Every piece of the planet we’ve seen – each zone, each ocean, each mountain – was formed in the wake of those ancient battles. The continents we traveled on, both in Outland and in the alternate version of Draenor we encountered during Warlords, were remnants. They were the lingering corpses of creatures whose sizes are almost impossible to comprehend. And although Aggramar left that world behind, his influence continued to shape the planet long after he left. Next week, we’ll look at the continued evolution of Draenor’s natural life – and what influence that may have had on Azeroth’s future.